25 And a lawyer stood up and put Him to the test, saying, "Teacher, what shall I do to inherit eternal life?" 26 And He said to him, "What is written in the Law? How does it read to you?" 27 And he answered, " YOU SHALL LOVE THE LORD YOUR GOD WITH ALL YOUR HEART, AND WITH ALL YOUR SOUL, AND WITH ALL YOUR STRENGTH, AND WITH ALL YOUR MIND; AND YOUR NEIGHBOR AS YOURSELF." 28 And He said to him, "You have answered correctly; DO THIS AND YOU WILL LIVE." 29 But wishing to justify himself, he said to Jesus, "And who is my neighbor?" The Good Samaritan. 30 Jesus replied and said, "A man was going down from Jerusalem to Jericho, and fell among robbers, and they stripped him and beat him, and went away leaving him half dead. 31 "And by chance a priest was going down on that road, and when he saw him, he passed by on the other side. 32 "Likewise a Levite also, when he came to the place and saw him, passed by on the other side. 33 "But a Samaritan, who was on a journey, came upon him; and when he saw him, he felt compassion, 34 and came to him and bandaged up his wounds, pouring oil and wine on them; and he put him on his own beast, and brought him to an inn and took care of him. 35 "On the next day he took out two denarii and gave them to the innkeeper and said, 'Take care of him; and whatever more you spend, when I return I will repay you.' 36 "Which of these three do you think proved to be a neighbor to the man who fell into the robbers' hands?" 37 And he said, "The one who showed mercy toward him." Then Jesus said to him, "Go and do the same." Who is Jesus talking about here really, when He speaks about the charitable Samaritan? The great majority of people would probably answer without any more ado: Us! He puts up an ideal for us. He speaks of and shows us, how He wants us to be and what to do. That is also the most common explanation you hear from the pulpits almost everywhere. It is presented as an ideal text, and what is mostly left clinging in peoples ears after is exactly: “Go and do the same!” (v.37). And it is ideally also, but not above all! We should pay attention to the word of Jesus here as well: “Take care how you listen!” (Luke 8:18). This – and these – whom always tempted Jesus (v.25), was not capable to hear the Word of God other then as ideals, admonitions and law. What does God want us to do? And clearly there was required a not so little portion of hypocrisy, dissimulation and misinterpretation of God’s laws demands down to an “acceptable” level, to be able to hold out, and have any hope of salvation (inheritance of eternal life). That is exactly what Jesus calls these people, both learning and life – hypocrisy! And this is what He tells His disciples to beware of in Matthew 16:6, where He describes them as the leaven dough. In other words, something that will gradually permeate everything. How this understanding – in proportion to God – had made them obdurate, we can see among other of his opening question: “Teacher, what shall I do to inherit eternal life?” (v.25). Is it normal that you do something to inherit? It is owing to your birthright. We also find the same question aimed toward Jesus of a ruler in Luke 18:18. This was the teachers of Israel! Already the first word he puts into his mouth reveals his hypocrisy: “Master!” He certainly did not see Jesus as a Master, but on the contrary he wanted to set a trap for Him, and unveil Him as a false teacher. This man considered himself as holy! There was nothing to say against his knowledge – but He continues: “Do this and you will live.” What you know is right, and God’s will – also do that! The way to true experience always goes here. For example you who think that you have great faith – say to a mountain that it shall be cast into the sea. (Matthew 21:21b). This does not even require great faith, but only a mustard seed (Matthew 17:20) – the smallest of all seeds (Matthew 17:32) – according to Jesus. Well, let us not exert ourselves here, let us just settle with a tree: “Be uprooted and be planted in the sea; and it would obey you.” (Luke 17:6b). Does not that work either? Well, settle with moving the book on the table before you then. If that does not succeed for you, you have at least learned something true – if not pleasant – about your faith – it is smaller than a mustard seed! At least, you do not have to imagine something that is not true. If it was nothing to put off on this man’s knowledge, his practicing was obviously not equally good, something that his "wishing to justify himself" (v.29) shows. Jesus – the true light – touched and revealed something that created unease in this mans inner being. His “construction” through many years creaked and wavered, and he stepped immediately in to save it, to seek to break the sting that touched him, and bypass the unpleasant and pushing in it, by turning the focus on another problem: “And who is my neighbor?” (v.29b). He stood there already judged of course, and if he in truth would have opened up for the acknowledgment Jesus had brought him to, he should’ve “understood” and assumed the work of Golgotha, when that time came. The alternative to this is a glowing and bitter hate against the truth, which will say towards Jesus, because it/He tears down what they put their trust in, and is an honor to them. It was this hatred that brought Jesus to the cross. You can read about the reason to Jesus crucifixion here about this man: “But wishing to justify himself.” (v.29a). 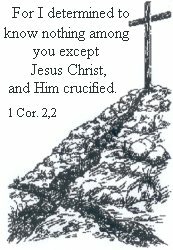 Even if the deepest reason for Jesus cross is in God’s savior will. It is His savior way for you! “Jesus replied and said.” (v.30a). He used this opportunity to come with this story. This man, who had fallen among the robbers, did obviously not belong among the upright in Israel. We can see that in the two cities Jesus talks about: Jerusalem and Jericho. The first one – God’s holy city, and the other – the one of God - by Joshua - cursed city. (Joshua 6:26-27). Here it says that he went from one, and down to the other. (v.30). It is just like the lost son, who left his father’s house, and went to a land far away. And what is longer away from God than what for the sin’s sake is cursed by Him? Then – on the way – he fell among robbers. Are you lying half dead, without life in God, among robbers, you who were intended for the Lord’s community here on earth, and the heaven’s glory in eternity? Both the priest and the Levite who came, saw him, but passed by on the other side. (v.31-32). Why? Yes, because of their hard hearts first of all, but also – and mostly of that reason – that they did not have what it took to save him. Their God was the God who helped the one who helped themselves – in other words, a God of the Law. And how should a poor one, who could not even lift his finger, manage before Him? But then this Samaritan, the ejected, false teaching, the one who in their eyes, nothing was right with. Do you now see who the charitable Samaritan is? And who is the one who lies so helplessly by the road? Hopefully you know the answer! You may say: “He looks so much like me where he is lying, undressed, helpless and lame!” I thought the world – this Jericho – would satisfy the heart’s desire, but look, it has left me with an empty soul, far away from God. Jesus also had, towards this legally trained whom He wanted to save, a completely certain intention to use exactly this Samaritan in the story. They were – with their quasi teachings – looked down on of the true believing Jew’s, but here the legally trained must realize and admit that after the Law one is not righteous according to their descent – that you are a Jew – but after deed, no matter what kind of people you belonged to. As Paul also says in Rom. 2 that “not those who hear the Law, are righteous before God, but those who do after the Law…” And that is whether they are Jews or heathens. This was the Lord’s answer to the legally trained man’s question: “And who is my neighbor?” (And he had to answer himself): “The one who showed mercy toward him.” (v.37a). Love is the fulfillment of the Law! Jesus is the true fulfillment of the Law! He had to – without knowing himself – testify about Jesus this legally trained; that is the one who showed mercy: “I desire compassion and not sacrifice.” (Matthew 12:7). He wanted to tempt and trap Jesus, but was himself standing as an undressed, lost sinner – one who not even had done what a Samaritan could do, despite his knowledge. It says nothing of it here, but now he hopefully saw: It is me who is lying there by the road! For no one poor and starving, goes empty handed away, from a meeting with Jesus. (Luke 15:53a). Do you have what it takes to save a poor man such as this one? You do if you have been saved yourself! It is not your love you see, your ability or your deed it is asked for, but Jesus’ – the charitable Samaritan’s. Look how He in every way heals and provide for the poor man! Everything has been thought of! Nothing has been spared! It is first when Jesus has taken care of a person in this way that it really belongs to Him. Therefore He also says: “I did not come to call the righteous, but sinners.” (Matthew 9:13b). Yes, then you are forever His!